Mid century painting of a bass breaking the waters surface to attack a lure. Signed, and dated 1966. Framed acrylic painting on board. This looks like a Mid Century Abstract Bass fishing painting . Others around me didn’t see it. They just saw an abstract blur. But I could see the bass breaking the surface of the deep blue water with energy and force, and had to have it. But there is more to this than an attack of the red lure by the bass. Look closer and you may see a gun shooting a bullet through the profile of a mask, or face. The white horizontal area that looks like the bass breaking the surface of the water, can also be seen as smoke from the gun being fired . For many years I’ve focused more on realism, impressionism, en plein art, and illustration art, but lately I’ve been picking up a few abstract works. It’s sometimes the passion and the energy in the painting that speaks to me the most, and this painting of this bass striking the lure really has both of those attributes . When I got home I was hoping to find what I couldn’t find when I bought the painting. 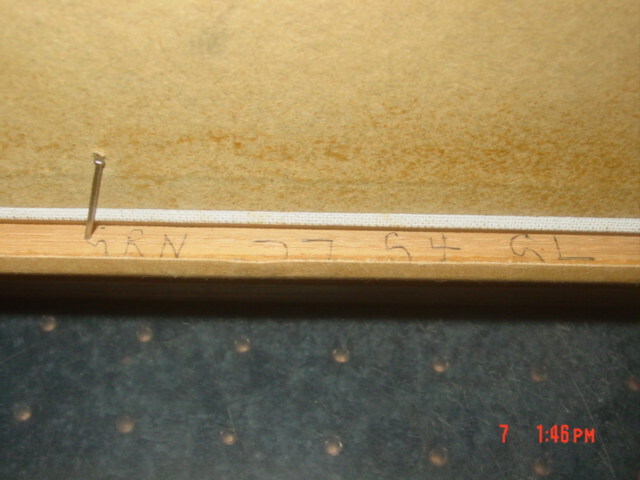 A signature, or identifier as to who painted this work. After using a black light to study every inch of the painting I thought that it might be under the lip of the frame. Long story short, that’s where it was hiding. But what does it say? Somebody named Jr. Looks like an R, but maybe that’s an F. Looks like a W in the middle of the signature, like it would be a middle initial. 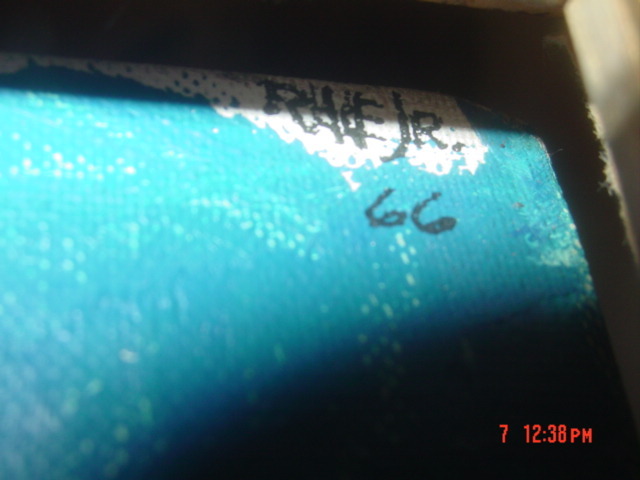 But I’m not sure of anything about this signature, but the W, and the Jr..
One more identifier is an inventory number on the back of the frame, as though it might have been put there by a museum, advertising agency, gallery, or the artist himself. So here I am, with a real nice painting that I really enjoy, but that I don’t have a whole lot of information on, as to who the artist is. So, if anyone reads this post, and can shed some light on the subject, or can decipher signature devices and signatures, please leave a comment, or get in touch. 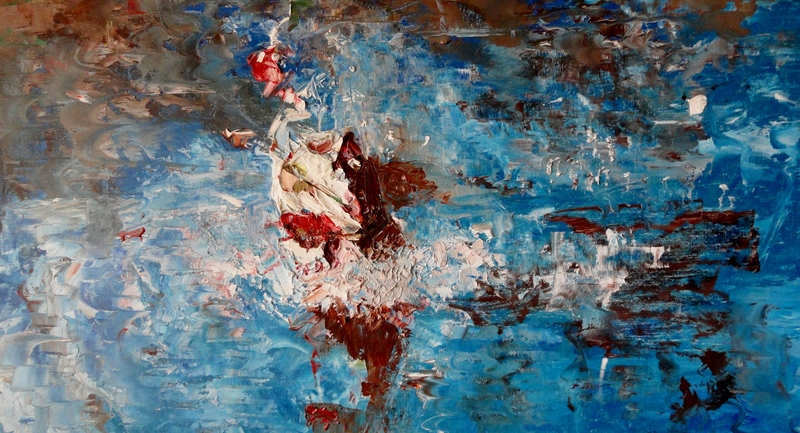 I’d really like to know who painted this dynamic Abstract Bass fishing painting. Make an offer. Ask a question.